The Shadow became a huge hit for Street & Smith. They realized that there was great demand for exciting action/adventure heroes. They tasked Oklahoma pulp writer Lester Dent (forced to use the pen name Kenneth Robeson) with the job and Doc Savage Magazine was born. 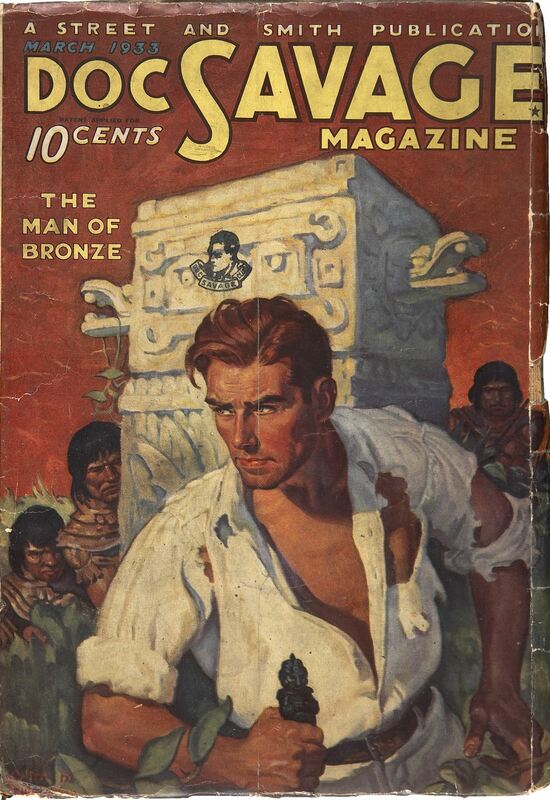 The first novel The Man of Bronze introduced Clark “Doc” Savage, the superhuman adventurer who would inspire nearly every comic book character of the Golden Age. Unlike The Shadow, whose stories were about the realistic underworld of big city crime, Doc Savage used high tech inventions, futuristic vehicles, and unparalleled training to fight evil all over the world. He is referred to in the novel as being a “superman.” We have seen so many characters like Doc Savage in comics and films that it seems like old hat now, but in 1933 there was no Captain America or Wolverine, there was only Doc. The novel today is still very readable and fun. I think a younger person would really enjoy it. The plot has to do with an undiscovered valley in South America. Doc’s deceased famous father left clues for his son on how to get there, but an evil organization is trying to stop him. Doc dodges assassins throughout the book and then has to stop a civil war between warring factions of Mayans. As for the love of a beautiful Mayan princess, Doc will have none of it! His only love is for righting wrongs and high adventure. Doc’s companions just shake their heads, but will follow him to the grave if he asked them to. Dent was not as talented a writer as Gibson, but what he lacked in prose, he made up for in imagination. Many action tropes can probably be attributed to him. Doc uses a fatal judo chop to the back of the neck which may be the first time that was used. One can see much of Bruce Wayne in Doc and is probably why Doc Savage comics never took off. The man in the batsuit beat him to it. Although popular in the 30’s after comic books surpassed pulps in the 40’s and 50’s Doc Savage faded into obscurity until the 60’s when his adventurers were reprinted in their entirety as paperback novels. It was the covers of these novels, painted by James Bama, that we got the well known look of Doc Savage with tattered shirt and exaggerated widow’s peak. The paperback run finally finished in 1990. 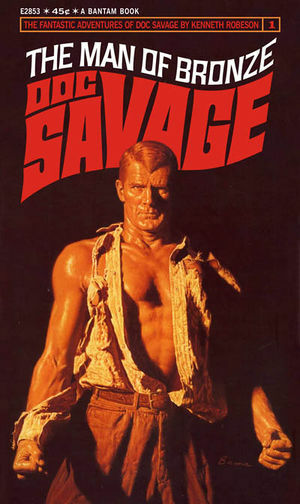 Shane Black will be directing a Doc Savage film starring The Rock as Clark Savage.